I really enjoyed these stories. Hadley James is finally living the life she’s always wanted: making jam and selling it at the local farmers market. 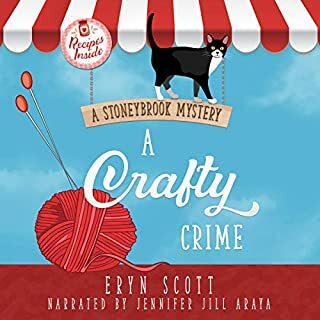 When a cat-sitting job turns into a murder investigation, life no longer seems so perfect. 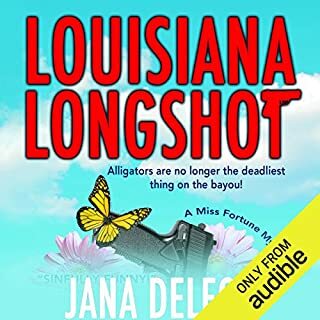 Her twin brother, a deputy sheriff, is on the case but they’ve always done everything together and she can’t help but get involved. Following a trail of crafty clues, the James twins learn that their sleepy town might be harboring more darkness than they could’ve imagined. Things are going great for Lexy Baker. She's finally opened her dream bakery, gotten rid of her cheating boyfriend and settled into her grandmother's house with her perky dog Sprinkles at her side. But her blissful life doesn't last long. 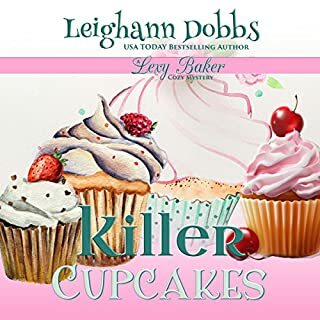 When her ex-boyfriend is found poisoned with cupcakes from her bakery, Lexy finds herself in the middle of a murder investigation headed up by her hunky neighbor detective Jack Perillo. 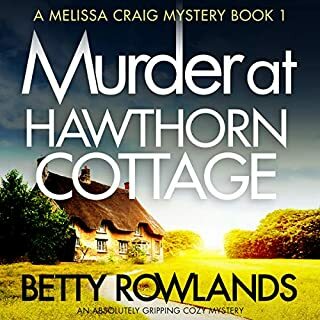 With the help of a gang of iPad toting, would-be detective grandmothers, Lexy decides to take it upon herself to find the real murderer. Would you drop everything and move to a town with a peculiar name, because an odd little man made you a strange offer? 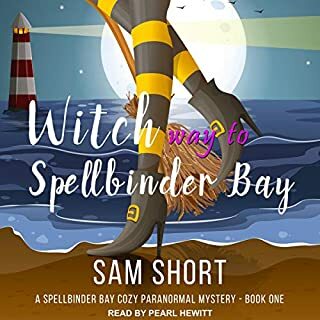 Millie Thorn did, and she could never have guessed what mysteries and revelations were awaiting her in the magical town of Spellbinder Bay. After witnessing a murder on her first day in the bay, Millie is cast into a world she never knew existed - a world of magic and the paranormal, and a world where it's seemingly normal to have a conversation with a cockatiel named Reuben. Would you recognize a serial killer if you met one? Talked to one every day? Artist Lia Anderson doesn't, and neither does anyone else who frequents the Mount Airy Dog Park. 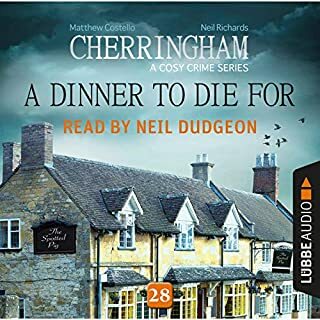 But a violent death brings Detective Peter Dourson into the close-knit group, and he is convinced someone is not who they seem. As the investigation uncovers secrets, Lia struggles to cope with warring emotions and a killer watches. Fiona Fleming is in so much trouble. 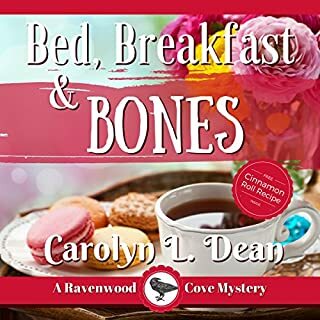 Her recently inherited bed and breakfast might not actually be hers thanks to the underhanded misdealings of the local real estate bully. Despite her grandmother's last will and testament, Fee might be out of luck and on the street before she even gets settled. But when her new enemy floats belly up in her koi pond, she's the prime suspect in his murder! Can she uncover who the real killer is before the smoking-hot new sheriff puts her behind bars instead of asking her out on a date? What would you do if you discovered you were a witch? That's exactly what happens to private investigator Jill Gooder. And as if that wasn't enough, she has a serial killer to catch. More magic, mystery, and laughs than you can shake a stick at. Amanda Graham inherited a rundown bed and breakfast, a starving cat, and some dead guy who's buried in her garden! What should've been a simple remodeling project and a new business in a small Oregon beach town winds up with her uncle named as the number-one murder suspect, a slew of odd neighbors and problematic townspeople, and Amanda wanting to just sit down and eat her weight in chocolate pie. 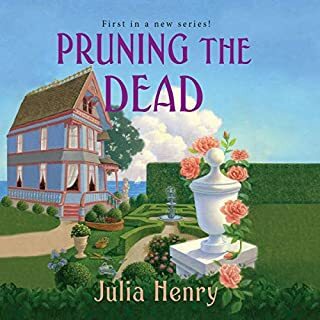 Soon Caitlyn finds herself fending off a toothless old vampire, rescuing an adorable kitten and meeting handsome aristocrat Lord James Fitzroy...not to mention discovering that she herself might have magical blood in her veins! When she's dragged into the murder investigation and realises that dark magic is involved, Caitlyn is forced to choose. Can she embrace her witchy powers in time to solve the mystery and save those she loves? Some books are worth revisiting, and when Pearl Hewitt is the one to read it to you, it is entertainment X 10! H. Y. Hanna penned a marvelous introductory to her Bewitched by Chocolate series that earned from me a 5/5 rating and a nod as a Top Ten all-time favorite series. 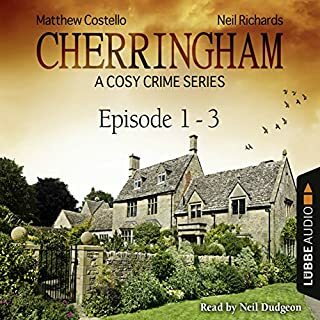 Caitlyn Le Fey is shocked to discover she is adopted learning she had been born in the Cotswold village of Tillyhenge. 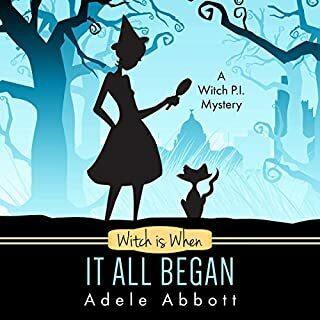 Curiosity wins over the pleas for caution from her cousin, and she decides to visit and explore her roots, but the revelations about her family and background are more than she could ever imagine…a witch? Then there's the mysterious death, ancient stone circle, vampire bodyguard, handsome Lord of the Manor, and everything mouthwatering chocolate. 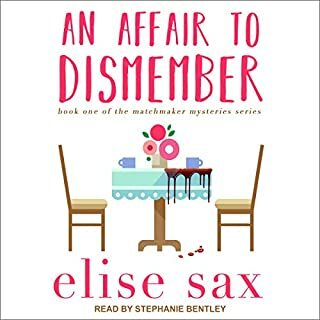 I am so deliciously in love with this book (and the series): descriptive third-person narrative, entertaining banter, engaging characters (some quirky), and a mysterious secret that begins to develop. And listening to it with the artistic talent of my favorite narrator Pearl Hewitt, Hanna’s vision now has audio! Emotions, tone, and personalities all come alive. Pearl has always entertained me with her ability to perform various British dialects along with American, and here she is at the top of her game with Hanna’s various characters from the villagers to the Manor household, from female to male, young or old, good or bad, and even a couple of “fur” friends, too. Everyone seemed different and very entertaining! It was Caitlyn’s vampire protector Uncle Viktor’s East European accent, however, that I was eager to hear…she nailed it! 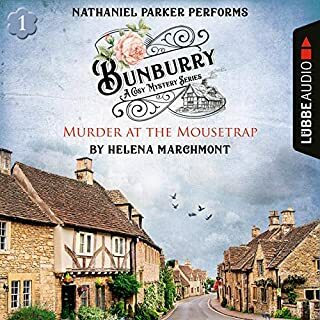 Audiobooks are not just a convenient way to multi-task with your favorite book, narrators take your favorite book and bring it to life! Pearl Hewitt has breathed life into H. Y. Hanna’s marvelous stories…a partnership that I get to enjoy. "Disclosure: I received an ARC. My review is voluntary with honest insights and comments." 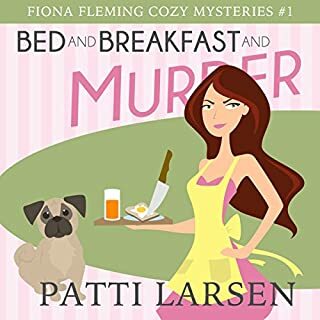 The Harry Potter of Cozy Mysteries! If you love H.Y. hanna’s other work then you will adore this series! The story begins in the tea shop, so there is a bit of story line cross over which was neat. The narrator is also the same, which I loved. It’s not over the top supernatural & it’s not scary at all. It’s cute & lighthearted with little bits & pieces of magic and enchantment. Think Harry Potter mixed with a cozy mystery. Lots of fun! Wonderful,& different! Fast paced funny! Some intrigue small town caring. Murder, witchery, & loving! Also very british. 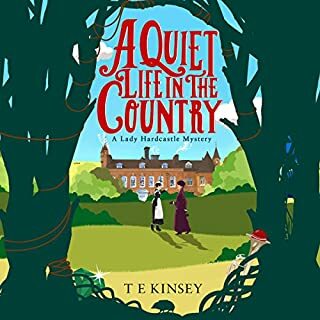 I bought this book because I enjoy Hanna's Oxford Tea Room series. I was disappointed. The characters and writing are juvenile and boring. I won't get the next one. I've love H.Y. Hanna's other books. This was a fun diversion. I will read another in the series. I really enjoy H.Y. 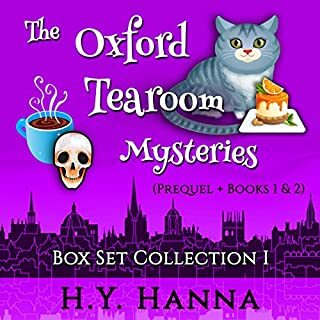 Hanna Oxford tea room mysteries, so when I saw she had a second series I thought I would give it a go. I have read the odd super natural book but am more into murder mysteries, so wasn't too sure if this was my sort of book or not. I am so glad I gave it ago. I really enjoyed the book and found the whole idea of witches being able to control chocolate to be fun and original. It was a fun read with quirky characters, that you find like able. It was a nice mix of magic and murder and I only worked out who the murder was at the same time as the heroine. Will definitely be giving the next book in the series ago. The narrator was good but it took a while to get use the the main character and her cousin's American voices. I have listened to this book several times since downloading it and it just keeps getting better. If you like the Oxford Tearoom Mysteries you will love Bewitched by Chocolate! 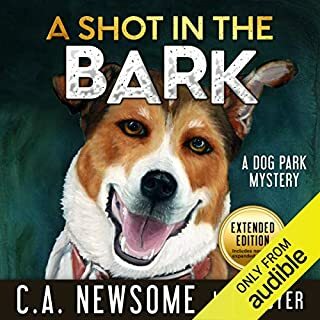 The story was a light easy listen, pulled me in enough to get through the book within a few days. 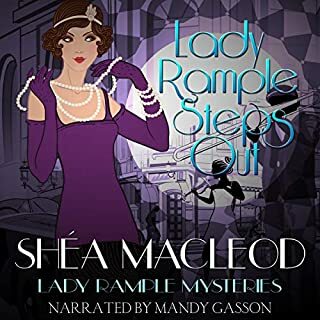 The narrator was generally lovely but oh my goodness the main character's young "sassy" American cousin Pamona -_- Could not handle and considered fast forwarding through her dialogue. I understand she is meant to be young use the word "like" a lot but the way the narrator does young American is pretty grating. The mean girls (older women actually) of the village are more than adequately mean to have the listener wanting to stand up for the other characters and the pacing is good. I feel like I only had flashes of this world and a large cast of characters that I don't feel like a fully know yet but this is the first in the series. I am definitely planning to listen to the second volume. 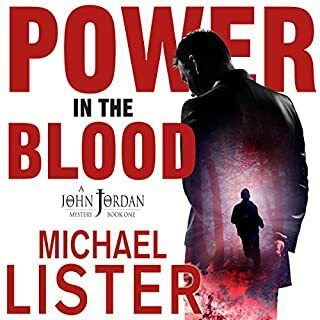 Overall a decent beginning with some concepts that intrigue me, and a setting and cast of characters that intrigue me enough to want to continue for the time being. Enjoyed the story. Light, fun, and kept me guessing. Good character development and plot. Excellent narration. A delightfully delicious first book in a new series. I enjoyed it immensely and immediately bought book two. I was really looking forward to working on an embroidery and listening to this story. So, if you like having your hearing damaged, go ahead. If not, avoid like the black plague. wow this was hard to listen. amateur performance mediocre story. would not recommend this to anyone.